We are having lovely Spring weather in California. We’ve had prolonged rainy seasons for the last 10 years or so. It’s really nice to experience some sunny days. All this Spring time warmth, made me remember how our school days changed in May in elementary school. As the year wound down and the weather got warmer. We started to get that “school is almost over” feeling. I think the teachers felt it too. The school had no air conditioning or heaters. Our only relief was drawing the large curtains over the wall of windows to bring in some coolness. Sometimes our teacher would take us to the lawn outside the classrooms in front of the school. She would read to us in the light breezes. Lunch changed, too! We were allowed to eat our lunches outside, something we were not allowed to do the rest of the year. On Fridays, it was hot dogs and french fries. That was the rare time that I bought a school lunch. We got our food in a little cardboard box and got to take it outside to the field to eat. School seemed to be less academic and more project and craft orientated. I remember there was a special week surrounding May Day and Cinco de Mayo that was devoted to multicultural activities. We got to go to different classrooms to do different crafts. Someone’s mother always set up a cooking area in one of the classrooms and homemade tortillas for us. They were great! 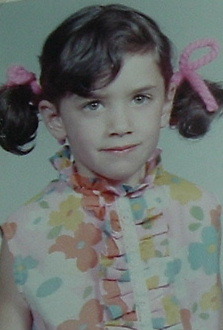 This terrified kindergartener is me…1969. I probably hadn’t heard about the Maypole when this school photo was taken.